Can you guess what candy bar I can be found stealing from my childrens' trick-or-treat bags? Oh wait, did I just admit to stealing their candy...okay you know YOU ALL do it too! Part of the exhilaration of watching our kids load up on the candy is knowing that some of it is ours. Let's just say it is part of our payment for giving them life, wiping their bums, staying up all night with them, and getting stretch marks. This year, I found a recipe for homemade butterfingers. Not because I am not planning on diving into their treat bags, but because...well my Little Men are learning to love Butterfingers too. I can justify taking some of their candy, but not their favorite. I know such a lovely motherly sacrifice. I was leery of this recipe. Could these really be just as good? I mean, really? I was especially fearful when I saw that there were only 3 ingredients. THREE. Oh and one of those ingredients was candy corn, uh say what? Yep, candy corn. I figured though, if there was a time to give this recipe a try, it was now. Now when candy corn assaults you at every store you go to. Ahhhhhhh (choirs singing not me screaming)...DE-lightful. How in the heck does peanut butter and candy corn make a Butterfinger? Well, I don't know but oh.my.word. it does. 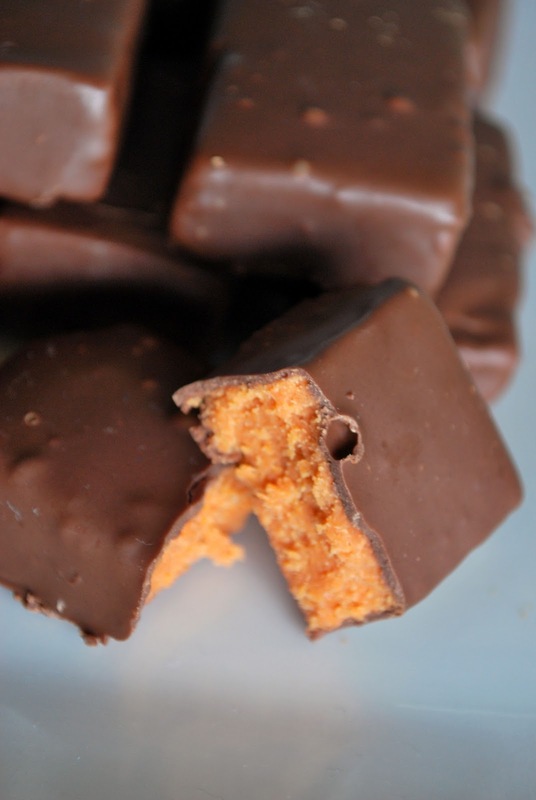 If you love Butterfingers, then please do yourself a favor-make this recipe. If you love your stomach, thighs, and bum then plan on giving some away to friends, neighbors, and passerbys before you eat them all yourself. Just sayin'. Melt candy corn in microwave for 1 minute. Stir and continue to cook and stir in 15 second intervals until candy corn is melted. Stir in peanut butter. Mix until completely combined. Spread the mixture into an 8x8 pan if you want them a little thicker, or a 9x13 if you want them a little thinner. Make sure the pan is lined with parchment or wax paper. Cool the mixture completely. After my bars cooled I actually wrapped the whole big brick of the pb/candy corn mixture in plastic wrap. I then let them set out a day on the counter before I covered them in chocolate. 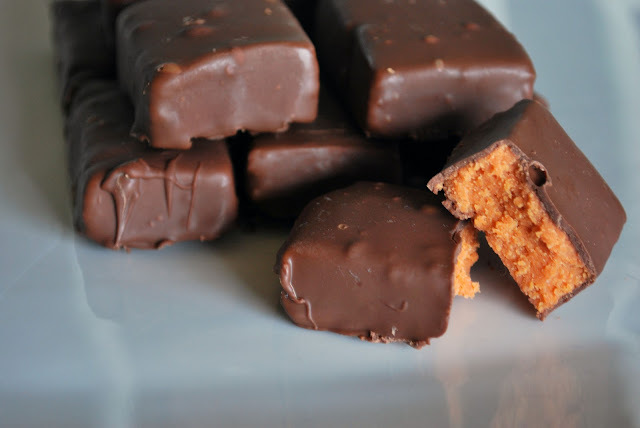 I personally think that this helped it give a little bit of the crunchy texture butterfingers bars normally have, where as the original recipe said the bars tasted like butterfingers but where chewier. Once you are ready to cover your bars, cut the brick into the size bars you want. Then melt chocolate in the microwave for a minute. Stir and continue to cook and stir in 15 second intervals until chocolate is melted. Drop the bars in the chocolate one at time. Cover with chocolate, lift out (I use a fork to scoop out so the chocolate will drip off). Make sure to get as much of the excess off. Then lay on wax paper and let the chocolate harden. After trying one, then another, store the rest in the refrigerator in an air-tight container. I think they are even better refrigerated. OH MY I must try this!! They look like butterfingers. They sound really easy to make. I might have to stock up on candy corn to make this when they aren't easily found! Well it is good to know there is a purpose for candy corns, cause up until know I seriously was not sure what on earth it was!! Wonder which came first???? Oh no....you did not just post something that yummy. Now I'm going to have to try them you naughty, naughty girl. Melanie, it is cause we worked of our fannies...quite literally...hahaha. I work out so hard so I can have a treat now and then...woot..woot! 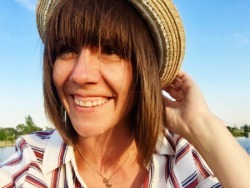 Colleen-I was wondering about something like that...totally worth a try! tried these today, weird that melted candy corn and peanut butter is the filling! I think we should have left them out like you did. The taste was there but the consistency was funky for me. making these now, maybe because I bought my candy corn from the dollar store they are a little weird. I hope they are good taking them to Super Saturday. I am normally not a huge butterfinger fan, but these look way good!